If you’d asked me 10 years ago if I thought The Boston Globe and other metropolitan dailies would still be printing news on dead trees in 2015, I’d have replied, “Probably not.” Even five years ago, by which time it was clear that print had more resilience than many of us previously assumed, I still believed we were on the verge of drastic change — say, a mostly digital news operation supplemented by a weekend print edition. Seen in that light, the Globe’s redesigned Saturday edition should be regarded as a cautious, incremental step. Unveiled this past weekend, the paper is thinner (42 pages compared to 52 the previous Saturday) and more magazine-like, with the Metro section starting on A2 rather than coming after the national, international and opinion pages. That’s followed by a lifestyle section called Good Life. How bad is it? According to the Pew Research Center’s “State of the Media 2015” report, revenue from print advertising at U.S. newspapers fell from $17.3 billion in 2013 to $16.4 billion in 2014. Digital advertising, meanwhile, rose from just $3.4 billion to $3.5 billion. And for some horrifying perspective on how steep the decline has been, print advertising revenue was $47.4 billion just 10 years ago. 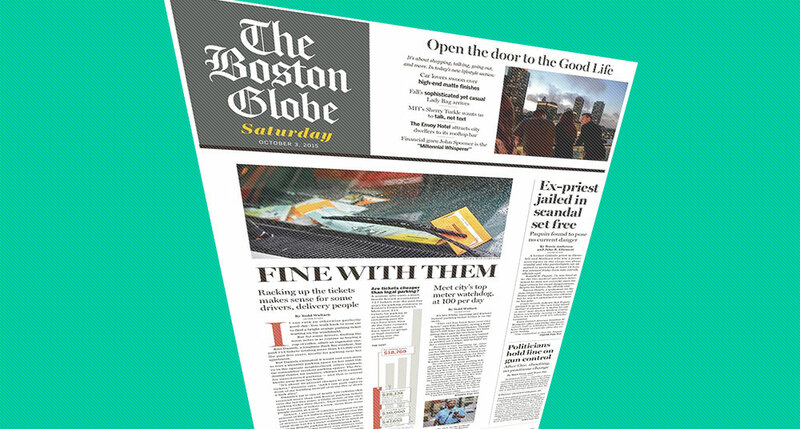 “I don’t quite think of it as the demise of print,” says Globe editor Brian McGrory of the Saturday redesign. He notes that over the past year-plus the print paper has added the weekly political section Capital as well as expanded business and Sunday arts coverage and daily full-size feature sections in place of the former tabloid “g” section. Some of those cuts in print are offset by more digital content. Consider the opinion pages, which underwent a redesign this past spring. (I should point out that McGrory does not run the opinion pages. Editorial-page editor Ellen Clegg, like McGrory, reports directly to publisher John Henry.) The online opinion section is simply more robust than what’s in print, offering some content a day or two earlier as well as online exclusives. This past Saturday, the print section was cut from two pages to one. Yet last week also marked the debut of a significant online-only feature: Opinion Reel, nine short videos submitted by members of the public on a wide variety of topics. But all of this is far afield from the changes to the Saturday paper and what those might portend. McGrory told me he’s received several hundred emails about the redesign, some from readers who liked it, some who hated it and some who suggested tweaks — a few of which will be implemented. Traditionally, a newspaper’s Saturday edition is its weakest both in terms of circulation and advertising. In the Globe’s case, though, the Monday, Tuesday and Wednesday papers sell a few thousand fewer copies than Saturday’s 160,377, according to a 2014 report from the Alliance for Audited Media. No doubt that’s a reflection of a Thursday-through-Sunday subscription deal the Globe offers — though it does raise the question of whether other days might get the Saturday treatment. One question many papers are dealing with is whether to continue offering print seven days a week. Advance Newspapers has experimented with cutting back on print at some of its titles, including the storied Times-Picayune of New Orleans. My Northeastern colleague Bill Mitchell’s reaction to the Globe’s Saturday changes was to predict that, eventually, American dailies would emulate European and Canadian papers by shifting their Sunday papers to Saturdays to create a big weekend paper — and eliminating the Sunday paper altogether. The Globe and Mail of Toronto is one paper that has taken that route, and McGrory says it’s the sort of idea that he and others are keeping an eye on. But he stresses that the Globeisn’t going to follow in that path any time soon. Previously published at WGBHNews.org and republished in The Huffington Post. With Instagram and Twitter-primed iPhones, an ever more youthful press corps, and a journalistic reward structure in Washington that often prizes speed and scoops over context, campaigns are increasingly fearful of the reporters who cover them. On Tuesday, Hamby was back at the Shorenstein Center, this time to tout the journalistic virtues of an even more ephemeral media platform: Snapchat, built on 10-second videos that disappear as soon as you view them. Hamby, who is barely older than the 18- to 34-year-old users he’s trying to reach, told a friendly but skeptical crowd of about two dozen that Snapchat is bringing news to an audience that is otherwise tuned out. My personal philosophy about new media platforms is to watch them from afar and to more or less ignore them until it’s no longer possible to do so. That served me well with networks like Foursquare and Ello, which seem to have faded away without my ever having to partake. On the other hand, I’ve been tweeting since mid-2008, which is about the time that Twitter’s emerging importance as a news source was becoming undeniable. Snapchat, it would appear, has reached that turning point. It already has about 100 million daily users, the vast majority of them between 18 and 34, as Michael Andor Brodeur notes in The Boston Globe. And it is starting to branch out beyond those 10-second disintegrating videos. 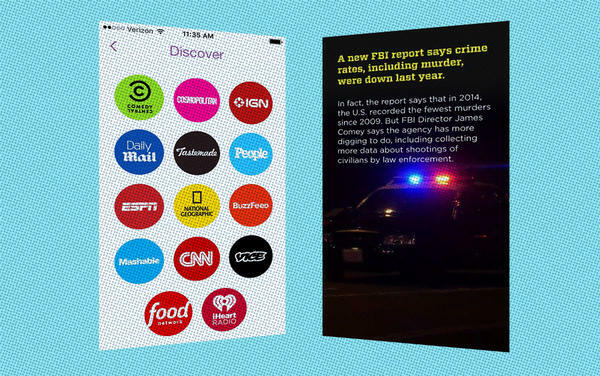 The newsiest part of Snapchat is called Discover — channels from media organizations such as CNN, ESPN, Vice, BuzzFeed and National Geographic that provide short graphics- and music-heavy stories aimed at providing a little information to a low-information audience. CNN’s fare of the moment comprises such material as the fight between Afghan and Taliban forces in the city of Kunduz; an FBI report that crime rates are dropping (a story consisting of nothing more than a video clip of a police cruiser with flashing lights, a headline and a brief paragraph); and the re-emergence of the Facebook copyright hoax. For me, at least, the most frustrating part of my brief experience with Snapchat (I only signed up Tuesday morning) has been finding worthwhile — or any — content that’s not part of the Discover channels or the Live Story of the moment. The search function is not especially useful. 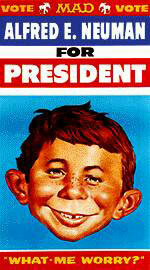 I did manage to friend several news organizations and presidential campaigns. Any user can create a story that will stay up for 24 hours. So far, though, I’ve only managed to see relatively useless clips from Rand Paul and Lindsey Graham. Hamby gives points to former candidate Scott Walker and current candidate John Kasich for their imaginative use of Snapchat. But as best as I can tell, Kasich hasn’t posted a story in the past day. His campaign website — like those of a few other candidates I looked up — does not include his Snapchat username, even though it includes buttons for Facebook, Twitter, Instagram and YouTube. Snapchat is mobile to a fault — you can install it on an iOS or Android device, but not a laptop or desktop computer. That makes it fine if you’re on the go. But for an old fogey like me, it complicates the process of finding worthwhile material. And vertical video! Yikes! It makes us small and it makes us pissed off and mean, because Twitter as a conversation is incredibly acerbic and cynical and we don’t need more of that in coverage of politics, we need less. But to the extent that we have to bring news to where the audience is rather than waiting for people to come to us, then yes, Snapchat may prove to be a valuable home for journalism. I just hope it whets users’ appetites for something more substantial. The most important (and chilling) finding from the latest Pew Research Center/Washington Post survey is that 56 percent of Americans say they support the National Security Agency’s surveillance of phone records, email and other cloud surveillance systems for electronic traffic. A few, though, have pointed to a chart showing supposed hypocrisy on the part of Democrats. In January 2006, self-identified Democrats opposed the NSA’s surveillance programs by a margin of two to one. Today they support those programs by an almost identical margin. I added the emphasis in both instances to highlight the differences. Under George W. Bush, without court approval; under Barack Obama, with court approval. And: “listening in on phone calls” in 2006 versus “track[ing] calls” in 2013. A considerable difference, regardless of what you think of the NSA’s activities (and, for the record, I’m glad they’ve been exposed).